Been looking at a Rock Island Arms Tactical 1911 to expand my Bullseye equipment. It's a mil-spec gun and I have read many positive things about them, though some gun snobs seem to think they are junk. Other than the parkerizing that people think is a bit below par, the guns generally get positive reviews. Since 1911 parts and accessories are very easy to come by, I figure I can modify the gun to my heart's content. I have my eye on model #51431 or model #51447. The match grade models are over $800, which is out of my price range. For right around $500 clams, they seem to be the best deal going on 1911 pistols. What do you guys think? as my carry gun, and it's great. Decent trigger, super reliable, and it shoots good. It has GI sights, and it puts my target loads a little low of my point of aim. At 25 yards I have to aim at the top of the black and the 1st magazine was 3x 2-10s the other mag was a tight group in the 9 at 6o'clock. 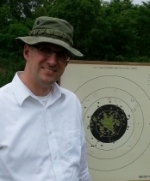 At 50 yards I was able to aim at the text at 12oclock on the target and all 10 rounds were on the repair center. I was amazed such a cheap gun was capable of 50 yard shooting. If that's the best 1911 you can afford, go for it. As long as you take care of it, you could always sell it for a little less than they are selling for new and use that money to move up. I own a RIA GI (not the one above) in 9mm and it is a decent gun. The original gun was very GI in fit, which by that I mean the slide/frame and bushing fit were typical GI tolerances. I replaced the bushing with a custom EGW and the groups tightened considerably. However, I could never get the barrel to shoot lead without leading (rough bore), so I replaced the barrel with a Kart EZ-fit and it is now a pretty good shooter. I never tightened the slide/frame, but I did replace the trigger and sights. It's not a bullseye gun, but for $600 it's good and reliable. Good luck. From a gunsmithing perspective, any 1911 clone can be made to shoot excellent 50 yard groups. But the poor machining and poor tolerances make the gunsmiths job twice as hard and 2-3 times more time consuming to build. In this day and age of CADCAM machined parts, oversized match quality parts, anybody can build a decent pistol. A real gunsmith that started out building series 70 Colts can build any of the cheaper quality 1911 clones into a match quality pistol. So if that's all you can afford, more power to you. Just find a gunsmith who understands the differences. For example, a Caspian frame and slide can be fit without much effort, they are oversized and can be hand fit with a stone. A loose frame to slide fit of the cheaper quality pistols requires peening the rails and fitting. It's a ton of work to do it right. Most cheaper slides have the lugs machined off center or crooked. Real pain in the rear to fit a match barrel, but if you are experienced in the ways of barrel fitting it can be done to near perfection. Swap out the inferior internal parts for good quality parts. They will last longer. So now you have a match quality pistol that will shoot as good as anything out there, but it doesn't have the fancy overpriced name on it. A good BE smith can build it to shoot well. But the gunsmith will be cussing under his breath every step of the way because they are a real pain to build. The gunsmith will not profit much on this build because it takes considerably more time to build it for the same price as working on a top quality pistol. Been there done that! I just re-read the post. If you are shooting a pistol with iron sights or slide mounted scope, the frame to slide fit is not as critical. The barrel is locking into the slide and the iron sights and scope are mounted on the slide. So in theory you are still sighting off the barrel to slide relationship. If you are frame mounted for scope, it is absolutely critical that the slide to frame fit is perfect. You are sighting off the frame, not the barrel!!! Now the slide needs to be in the same exact spot everytime for repeated accuracy. Assuming zero tolerance barrel fit, zero tolerance bushing fit and zero tolerance slidestop fit, a frame to slide fit with side to side play of 0.005" will vary or shift group side to side approx. 6/10". Now throw in ammo variations and you can see that the group starts opening up considerably. For years most of the pistols on the firing line were older series 70 type pistols that had marginal frame to slide fit. Thats why everyone shot slide mounted scopes. Now with the availability of oversized frames and slides we are seeing many people change to the frame mounted scopes. The tolerances are tighter and will stay tight for the life of the pistol if properly lubed. So if you are going to shoot a cheaper quality pistol, I recommend that you shoot optics mounted to the slide. I see many pistols that were marginally tightened and they start shooting loose, so if you are shooting optics off the slide it won't matter as much. There is a saying; "Speed cost money, how fast do you want to go?" Or, "you get what you pay for!" There's a reason Clark and other big name smiths work only on selected brands ... they (mostly) specify a price up-front for a service and expect to make money within that spec. While CAD/CAM machinery has allowed more consistent offerings from a really broad number of manufacturers, the fact remains that there is greater inconsistency, especially in tolerances, among 20 RIAs or Armscors than there is among 20 Colts or SAs. Everyone pops a lemon now and then but the rate is lower for some brands as compared to others. Clark's current list is: "Colt, Springfield Armory, Caspian, Norinco, Essex, STI, SVI, and Para-Ordnance"
(Yeah, I'm also surprised Essex made it ... they've had some manufacturing ups & downs over the years). I agree with Jon Eulette. Before I would buy a cheap 1911, planning on changing out most of the parts, I would do a cost breakdown on buying a Caspian frame and slide, and good after market parts to fit it up. If your going to spend 500.00, then have to buy and get installed good sights, and the barrel will have to be throated to feed wad cutters,after spending for the basic mods you could buy the Springfield range officer, it is a way better built gun and comes bullseye ready out of the box, if shooting open sights. I see them for 749.00 at several places. I know what it is like to do this sport on a budget. I do think you could do better than a Rock Island. My suggestion for a bullseye pistol on a budget would be a STI Spartan. This was my first bullseye gun and the fit is better than a RI and they can be had for around 600. Here is one on gunbroker for 550.00. I recently built a STI Trojan for a friend. Very nice pistol. Had good frame to slide fit (good for a factory pistol) and top notch parts. It turned out really nice, great shooting pistol. Not sure how close a Spartan is to the Trojan, but STI product seems ok. I have use some of their 1911 parts as well and am pleased. I believe the Spartan is one step below a Trojan. Thanks for the input fellas, I appreciate it! Yes, I plan on modifying/upgrading the pistol over time. I just want a somewhat decent pistol to start with. My local shop has a RIA Tactical in 9mm, and I was checking it out the last time I was over there. The guns seems to be very tight. The slide doesn't wobble from side to side, the trigger is decent but a bit heavy, and it functions quite smooth. Question about ammo. I can only shoot SWC through the gun for Bullseye, or can I shoot FMJ? You can shoot fmj or lswc. Most of us shoot LSWC because they are cheaper for reloading, and more accurate. If you buy that 9mm 1911 you will still need a .45 1911 to shoot the .45 stage. I agree with David R that if Bullseye is a sport you intend to stick with for awhile, the Springfield RO is worth the extra $250 over the RIA. It truly is so much better value. Just upgrading to target sights from the stock RIA sights will cost you almost that much. Though you said that the $800 target model was out of your price range, I would sooner coach you to put your $500 in your mattress until you have the $750 for a Springfield Range Officer. It's far superior to the RIA and was designed for Bullseye. It's the right tool for the job. It will also have better resale value if you continue to upgrade it and modify it over time. Also the S range O has been proven by many to shoot accurately at 50 yards, RIA barrels are made in the Philippians as well as most of there other parts, they are not made out of nearly as good metal as the Springfield and i wouldn't think they come with a national match grade barrel like the RO does. imo your wasting your money on a Ria, for a competition gun. I'm a range officer at a large club so I get to see and examine allot of 1911's. There is a tremendous variation when buying RIA's. Some people get good ones and some are just plain junk. Everybody touts the great customer service the RIA provides. There is a reason for this. Many problems and many have to go back for repairs. Having said all this I bought a 9mm Government RIA. It had, and this is no exaggeration, a 12 pound trigger pull trigger pull and the barrel looked like it had been rifled by hand. It went back and returned with a gravel like 7 pound trigger and a new barrel that wasn't much different than the first. The Slide to frame fit was decent so I gutted it and put in a Kart barrel, decent sights and C&S fire control parts. Now it's a nice, reliable accurate shooter. The problem being if I ever wanted to sell it I'd get the price of a used RIA since practically no one pays for upgrades. I am a pistol smith that gave it up 15 years ago. I shot bullseye mainly for fun. My best builds were Caspian frame slides. 15 years age SA sucked for trying to build a Great bullseye .45! I bought a Range Officer. $750 . Well the barrel was freakin junk !! Sent the gun back wo firing it. It had deep tool marks for 3/8 inch in from muzzle... Wow crap! They fitted a new good one. I bought a new Brown sear and Videcki match trigger and Wolff springs to make a real smooth 3.25 pound pull. Did not shoot it yet. Slide is not real tight ! My RIA I bought for fun is honestly way tighter and better fit than the RO ! These RIA are darn well made for the money and I did the trigger job with a Brown sear too and all Wolff springs. 4.25 now and smooth. The bbl is not match but is throated and polished nicely! Did not shoot her yet! I love it and the RO too! Talked to a friend that worked at Para. Frames are from South Korea. Para is just setting up CNC equipment to build frames in house. DavidR wrote: If your going to spend 500.00, then have to buy and get installed good sights, and the barrel will have to be throated to feed wad cutters,after spending for the basic mods you could buy the Springfield range officer, it is a way better built gun and comes bullseye ready out of the box, if shooting open sights. I see them for 749.00 at several places. I am glad I took your advice on this David. I just picked up my SA RO this evening and it was worth the extra wait to save up for it. Bought it on the internet for $729. It was $781 "out the door". Thanks for steering me in this direction! You will be so much more happy than if you bought the RIA! great price too!! !